"None of my customers have a "preferred payment method set. Is there anyway I can easily go through and set all of their payment methods without having to edit each individual customer in QuickBooks?" "I use the NELiX TransaX Payment Gateway, and I have 1000 customers that I have to add to the Customer Vault. Is there anyway to process them all in a batch, instead of one at a time?" "I have invoices that are generated from my website, and the payment is collected on the website. Is there anyway to get that invoice and payment data easily back into QuickBooks?" "I need to auto create many invoices periodically, which have complex rules on the generation of those invoices. Is there anyway to automate this?" Well, the answer was always "You'd have to have a programmer build a custom tool for you to accomplish that goal." Well, we've come up with a solution. 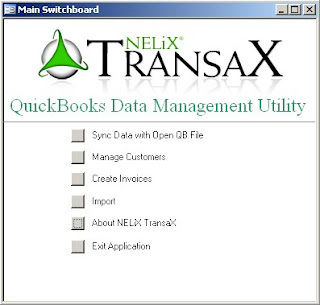 - When run, the database will attach to the currently open QuickBooks company file on the current computer. - Customers, Payment Methods, Items, etc, will be brought into the utility. - Users can update customers, add new customers, or add new invoices. - Customer Records are added and updated in QuickBooks, Invoices are created, and payment records created where applicable. - NELiX TransaX Customer Vault entries created where applicable. - Data can be imported in a preset format using an easy import tool. - Alternatively, Access savvy users can import or link to any data source, import data, manipulate as desired, then write that data into the tables that feed into our updater. This tool allows easily manipulation of customer data, and easy automation of invoice creation. And, best of all, it's free to any customer of NELiX TransaX!